Look up deputies with the help of this extensive, downloadable data product from Bookyourdata.com. Find the contact information of those working in deputy departments, and start contacting those in your target group now. Download it and start connecting within minutes! Contact deputies at many different commercial, nonprofit, and governing institutions using our pre-built database now. This is one of our many ready-to-download data products that are great for enhancing your business-to-business (B2B) marketing campaign and narrowing down your target audience. Speak to the group that's the most integral to your business. With this list, you can find employees working in deputy departments across fields and industries. You may find public officials, police deputies, deputy managers, integral staff, and many other high-value contacts working in those departments. Download this list to pull their specific names, titles, phone numbers, emails, and more. 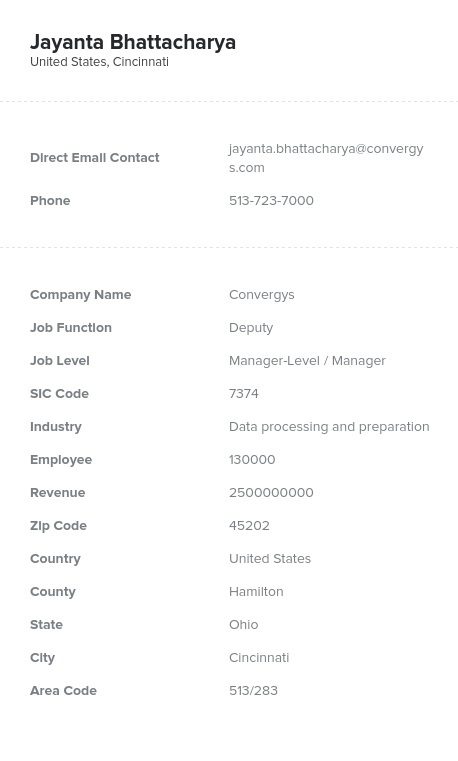 We don't provide generic emails (like [email protected]) but specific information so that you can directly find the people with the most decision-making power. After purchasing this list, you can download it and seamlessly integrate it into your CRM; the whole process only takes a few minutes, and then you'll be able to start building strong connections. Either purchase this extensive data, customize this list further, or create your own custom leads list with our list-builder tool. Start connecting with deputies and other high-ranking officials today with the help of this human-verified data product. Simply purchase this list to get started!